Minneapolis: 250 Rally with Brother Ali, Haphduzn for eviction blockade concert at Ceballos home | Fight Back! Brother Ali preforms at concert and rally to show support for the Ceballos family. Minneapolis, MN – About 250 community members gathered in the front yard of the Ceballos home, July 29, for a concert and rally to show support for the Ceballos family. The family, with the help of community supporters, fended off an eviction attempt by 30 sheriff deputies sent by JPMorgan Chase July 24. They expect another eviction attempt at any time. 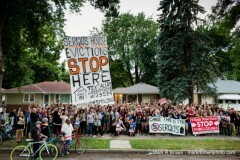 The concert marked the three-week anniversary of a round-the-clock occupation of the housemounted by housing justice group Occupy Homes Minnesota. When sheriffs came to evict July 24, more than 75 home defenders gathered in half an hour and easily moved back into the house. Occupy Homes MN has pledged to defend the home until Chase Bank negotiates with the Ceballos family. The concert included performances by internationally known hip hop artist Brother Ali, as well as local rapper Haphduzn. City Councilmember Elizabeth Glidden and State Representative Ray Dehn also spoke in support of the eviction defense. Sergio Ceballos, who has lived in his house for 13 years with his family, asked JPMorgan Chase Bank for a loan modification in 2010 after a divorce halved the family’s income. Chase told the Ceballos family they were considering them for a loan modification, but then filed for eviction at the same time. This process is known as dual tracking and is illegal under the national mortgage settlement. Brother Ali voiced his full support for the occupation. "This really does make a difference,” he said to the crowd. “The narrative they’ve built around working class people is that they’re irresponsible, that they’re lazy - that they don’t fight back. This is us taking control of the narrative."